Perfect for classroom or library-use. 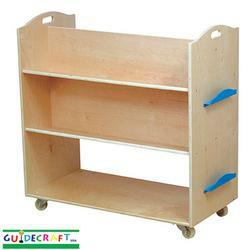 Features Baltic birch construction, heavy duty casters, and hand-hold cutouts. Angled top shelves, center divider and flat bottom shelf. Adult Assembly Required.